For patients in the Cleburne and Midlothian areas seeking quality restorative dentistry options, Long Family Dental offers a wide range of services. We can restore your smile and your oral health. We offer flexible financing, too, so you can afford the treatments you need to get the smile you want. If you want an idea about what your smile can look like fully restored, view our smile gallery. Why Choose Long Family Dental for Restorative Dentistry? A missing tooth should be replaced as soon as possible. Teeth use their neighbors for support, and when one is missing, those neighboring teeth start to shift inward. The bite changes in response to the pressure, which may lead to problems with the entire jaw. The surrounding teeth may also deteriorate, potentially resulting in additional tooth loss. As part of our restorative dentistry services, Long Family Dental offers bridges to fill in the spaces created by missing teeth and prevent future oral health issues. The sides of a bridge use the two surrounding teeth for support, with the replacement teeth fitting snugly in the smile gap. Bridge work is as much an art as it is an exact science. The materials used may be gold alloys, porcelain bonded to metal alloy, or all-ceramic material. The choice of material depends on requirements for strength, wear, and/or esthetics. 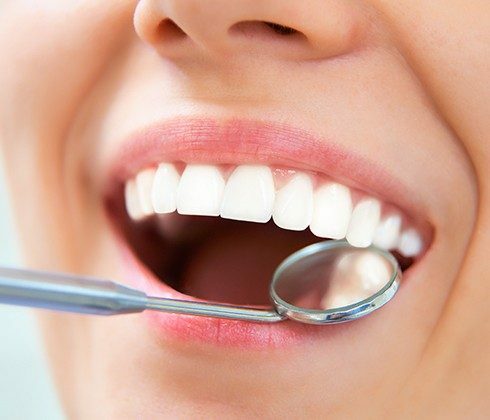 At Long Family Dental, we use the general dentistry option of treating cavities with fillings. Fillings are done to remove decay and replace the affected tooth structure. It is called a filling because new material fills the hole that decay left. Most teeth are treated with bonded tooth-colored composite resin fillings. Caught early enough, cavities can be treated easily and comfortably. If not treated, decay can lead to tooth pain and/or infection, and the tooth may need root canal treatment or even extraction. There are different types of dentures, but they share a common function. They replace teeth that have become loose or been lost due to bone loss. When bone loss around the roots of teeth becomes too severe, it's time for dentures. No one enjoys losing their natural teeth, but with this reliable reconstructive option, you can still eat and talk normally. At Long Family Dental in Cleburne and Midlothian, our experienced dentists will examine your entire mouth and determine whether teeth can be restored or will need to be removed entirely. If necessary, the loose teeth are then extracted. Then, dentures are created to be a comfortable, custom fit with the patient’s level of tooth loss. There is an adjustment period after dentures are placed in the mouth, and it can take some getting used to. But once accustomed to the dentures, all the normal functionality and appearance of a confident smile returns, and patients can carry on with their regular lives. Often, we recommend using dental implants further stabilize dentures and improve jawbone health.